Make your car unique with our Skunk With Tail Raised stickers. This skunk with tail raised sticker is a single color vinyl cut out that is very easy to apply and will last up to 5 years in both hot and cold climates. Skunk With Tail Raised Sticker is made of the highest quality vinyl material, designed specifically for outdoor use. The one-color design is cut out with extreme precision and maintains a more vibrant color over time than printed stickers. The Skunk With Tail Raised Sticker can be personalized to your preference color, shape and size. The weatherproof decals last for several years without scratches or fading. 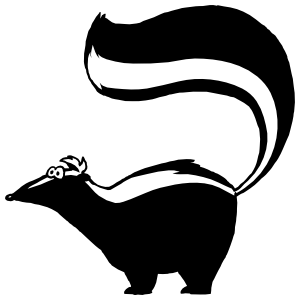 Easily apply the Skunk With Tail Raised Sticker to any smooth, clean surface. Transfer Stickers are stickers without a background. Order your transfer stickers from carstickers.com!